I had two chocolate bars waiting for me to review them. One milk and one dark. Which to review first? Well, it was an easy choice: this past week, I've found that I have been craving cookies and milk chocolate, so the milk chocolate it was. Sometimes, I've noticed, I crave sugar more when I'm alone. It isn't that I've been unhappy; quite the opposite. And I've been busy, doing various things both at home and outside of home. 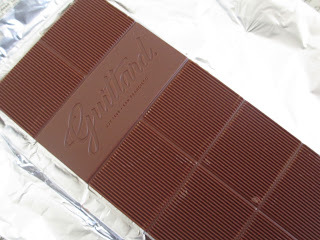 But I'll have that craving that leads me to finish off the last of my Christmas candy, seek out whatever I have that can pass for a cookie, and let my eyes fall on such chocolate as this 45% cacao bar from Guittard. 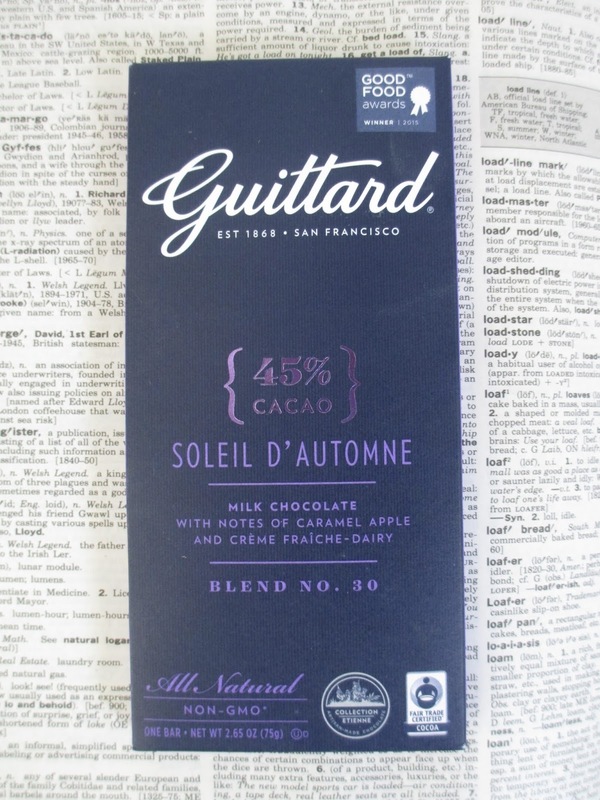 I used to love Guittard, back before they redesigned their packaging and introduced some new chocolates. Now I'm starting to rediscover them, so I'll probably be reviewing them more often again. The Soleil D'Automne is one of the new ones. This name translates to "Sun of Autumn," or "Autumn Sun," but I prefer to think of it as Autumn Sunlight. The flavor notes promise caramel apple and creme fraiche. It's the same simple packaging as before. I prefer the old packaging from years ago, but this one perhaps better matches current trends in chocolate bar packaging. 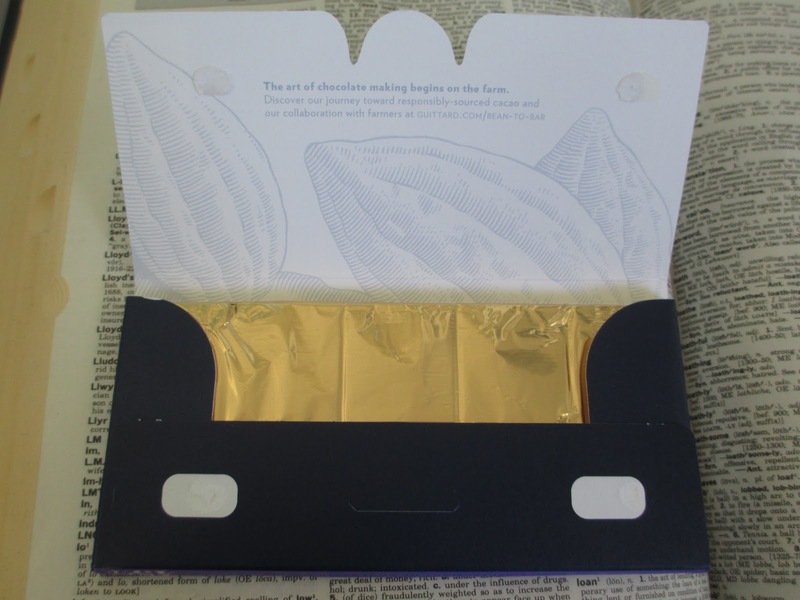 And I am fond of the envelope style with which the box folds open. Inside are simple gold foil and a simple chocolate bar design. All acceptable and inoffensive. The chocolate does smell like caramel, though this of course isn't unusual for milk chocolate. It's so cold right now that the chocolate takes much longer to melt and therefore move into its flavors than it normally would. Once it does begin melting, it tastes at first more nutty than like caramel. It has almost an almond flavor. This then moves into more creaminess and then a warmth that is almost like a spice. I wanted at first to say cinnamon but that wasn't quite right. Then I found why specifically caramel apple is one of the flavor notes. There is indeed that sort of fall taste that we associate with warm, baked, or caramel apples. And when I first thought of fall, I did indeed forget that this bar is named for that season. It is, then, aptly named: the chocolate truly does evoke that time of year. The more of this chocolate I eat, the more I begin to taste the cream as the sweetness and slight greasiness start to build up. Indeed, the cream lingers as an aftertaste for quite a while after the chocolate has melted away. Always, though, there is that warmth of autumn apples and the last shades of sunlight at the base. It doesn't quite have that added complexity that you sometimes get with milk chocolates that reach the 45% cocoa content, but the higher content does mean that the flavor isn't overwhelmed by sweetness. It's still sweet enough to satisfy, just not so much as to overwhelm. But what do I think of this chocolate bar overall? It isn't exactly the most brilliant milk chocolate I've ever had, and it isn't my favorite bar I've ever had from Guittard. But not every chocolate needs to blow my mind. 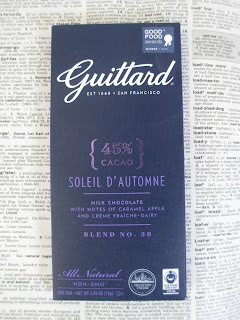 This chocolate is pleasant to eat, and it perfectly satisfied my craving for milk chocolate. Plus, it is non-GMO and fair trade, and there is definitely a market for simple milk chocolates that fit those two criteria. So I am quite happy with this choice; definitely reach for it when you're after a simple and solid milk chocolate.